Moss is an upcoming game about an adorable little mouse named Quill on a quest. Players don't control the mouse directly, but are instead a guiding presence, directing her in combat and moving obstacles so she can continue through the environment. 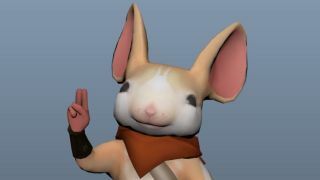 Since Quill can only convey her messages to the player using squeaks and gestures, animator Richard Lico decided to try another method of communication: sign language. Speaking to Kotaku, Lico said the animation effectively took three days: Monday night he got the idea, Tuesday was spent researching (since Lico himself had no knowledge of American Sign Language), and by Wednesday evening, it was up on Twitter. There, it gained thousands of retweets and likes, as well as a plethora of joyous replies. "I was expecting maybe eight or ten likes," Lico said. But Quill's adorable introduction garnered much more than that, and now Lico says the decision to implement sign language is cemented. Sometimes Quill will squeak, sometimes she'll sign, and sometimes she'll pantomime. The little rodent has already brought a smile to my face, and I look forward to Moss coming out on PS VR later this year.